50% OFF! 4Pcs Garden Hose Fitting Set worth Rs. 500 for just Rs. 250! Garden Hose Fitting Set - The best way to connect your hoses. This unique little gadget makes it quick and easy to disconnect your hose or switch nozzles. Just slide the ring and pull apart. 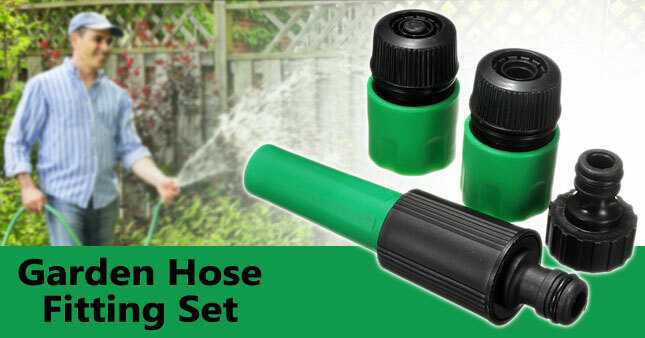 Also has an auto shut off valve to stop the water when the fitting is separated.This Quick Connect Hose Connectors includes tap attachments and hose handles to make watering the plants and washing the car easier. Ideal for use when watering plants or washing the car etc. 1 x Threaded Tap Connector-1/2" or ¾"
Voucher is valid only for one 4Pcs Garden Hose Fitting Set.